Our third week of school begins tomorrow! Yikes! Our "Pony Express" message for the first few weeks of school is about my students' names. After all, for most of them, that is the first word they learn to read. I begin by choosing a name from my name can. I write the name on the chart as the students write on their "hand slates". A "hand slate" is just their index finger on their palm. Next, I write the beginning letter of his/her name. 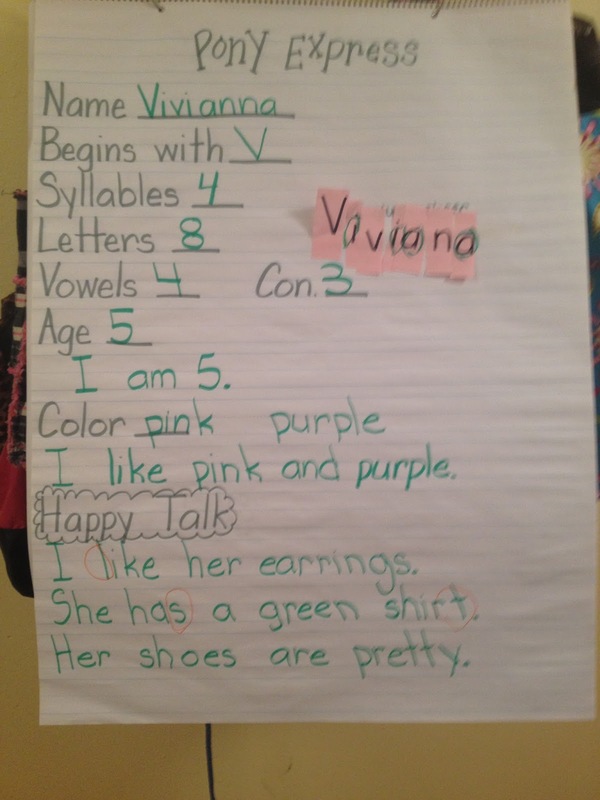 If anyone else in the class has the same letter in their name, we write it on the chart. In this case, no one had the letter "v". Then, we clap the name and write the number of syllables on the line. 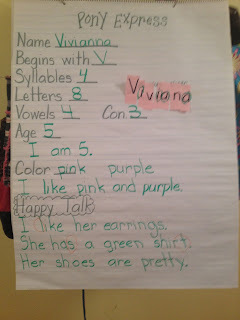 In this example, I wrote the student's name on a pink name strip and cut it apart. The selected student assembles his/her name and glues it to the chart. We circle the vowels and count the vowels and consonants. I ask them their age. We write their response in a complete sentence and I ask their favorite color. We also write that in a complete sentence. Finally, we get to "Happy Talk". I ask the class to compliment the selected student. We have talked about the definition of a compliment. And, I record their responses. Finally, I call out selected sounds and the student circles that letter. The entire process takes about 15-20 minutes. I am not taking credit for this idea...I've been to sooooo many conferences and read sooooo many blogs in the years that I have taught, I just can't remember where I got this idea! A very good systematic learning way to you shared about the pony express. Learning centers in Apopka and other places should follow or invent some learning and teaching techniques like this. Great post and useful information for us and other as well.